The new building on Østerbro adapts to the context and completes the residential block with its light coloured brick and zinc mansard roof. Large windows, balconies and the incisions in the roof give the façade a subtly modern expression and create interesting spaciousness and light. One of the project’s challenges was to accommodate the existing shop and basement, both of which were extended to the rear. 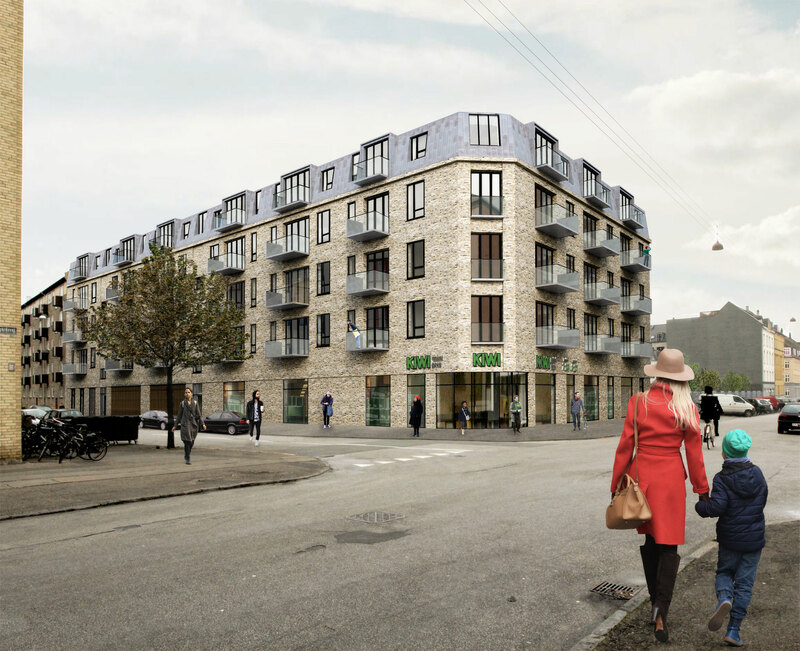 On the ground floor are communal facilities for the residents and the extended supermarket. The flats above face south with large folding doors onto spacious balconies. The tall windows and the open plan layout create spacious and light flats. The bedrooms are placed towards the more private courtyard. The flats on the ground floor have access to a private raised garden and there is a communal south facing garden separated from the street by a glass screen that shelters the space from noise but allows visual contact with the surroundings.